Dolphin Kick was available to buy from the 1st of April. I have two copies on DVD to giveaway here! It’s a lovely family film to watch over the Easter holidays. I am excited to be able to offer this competition here. You will enjoy seeing the developing friendship between 10-year-old Luke, his sister Skyler and Echo the friendly dolphin. That bond helps Luke handle the grief of losing his mum and spurs him on to reunite Echo with his own pod. Additionally, through that journey he finds the confidence to return to swimming again. Up until this tropical vacation Luke had been struggling to cope with the grief. This is a good film to help your children understand loss. There are lots of positive messages in the film. It’s great that it encourages children to be actively involved in the environment around them. Luke get involved in an ocean clean up so that Echo can return to his pod. I have had my boys do a few beach cleans in their time, I am all for doing our bit for conservation. For me I like films that teach us to respect our planet and Dolphin Kick does an excellent job of this. Furthermore, the film makes children believe in themselves, anything is possible when they put their mind to it. 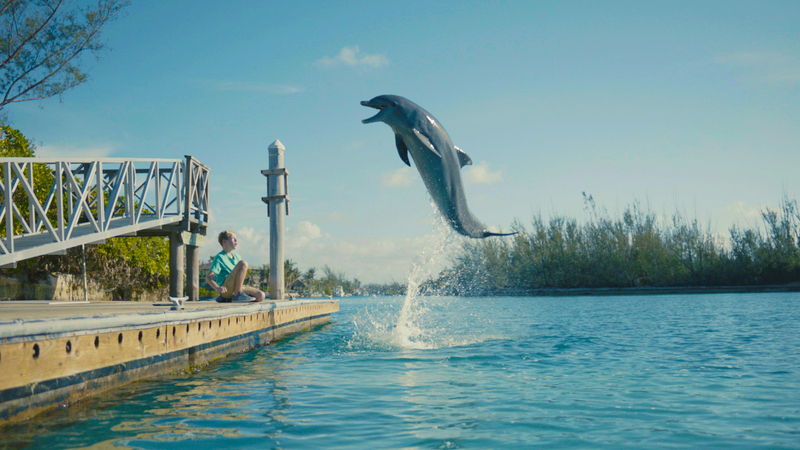 It is also an educational film as you learn more about dolphins’ habitats and behaviour. The footage of dolphins is incredible. I would prefer my boys watch this then too many action films. It’s a heart-warming adventure. You do have a bit of suspense provided by the angry fishermen who don’t appreciate Echo impacting on their fishing. It’s rated PG, but common sense media put it at 7+. If you would like a chance of winning one of two copies of Dolphin Kick on DVD please fill out the form below by the 7th of May. Check out my other competitions too!